Liam Neeson stars in yet again; another action film where his family is threatened with death−and, yet again he’s in a race against the clock as time is never on his side. 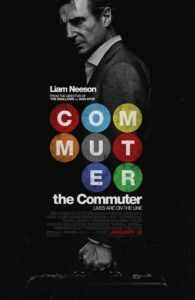 The Commuter is an action and drama from Lionsgate Studio. Neeson, a seasoned action-hero found success in the genre with the film Taken. Here he reunites with French director Jaume Collet-Serra as their three films: Unknown, Non-Stop, and Run All Night, were box office hits. Neeson plays an ex-cop who changed jobs ten years ago to work as an insurance salesman. At the beginning of the film, we view his daily train commute into New York City band are introduced to his everyday riders. One particular day appears to start out normally like every other day except the commute home becomes a nightmare. He’s blackmailed by a mysterious unnamed woman played by Vera Farmiga into finding the identity of a passenger on a train before the last stop. The 6’ 4” Neeson is perfect as an action hero, and this is the fourth action movie he’s completed with director Jaume Collet-Serra. The film also features Patrick Wilson, Jonathan Banks, with Elizabeth McGovern, and Sam Neill. The screenplay writers are Byron Willinger and Philip de Blasi. Ok, I’m a Liam Neeson fan but he needs to find better scripts. This one is way too long, overly complicated and unrealistic. At one point during a dramatic scene, several people in the audience were laughing…including me. Did you know that Neeson has appeared in over 70 films, including the Taken trilogy; Joe Carnahan’s The Grey; Bille August’s Les Misérables; George Lucas’ Star Wars: Episode 1 – The Phantom Menace; Christopher Nolan’s Batman Begins; Richard Curtis’ Love Actually; and Martin Scorsese’s Gangs of New York?